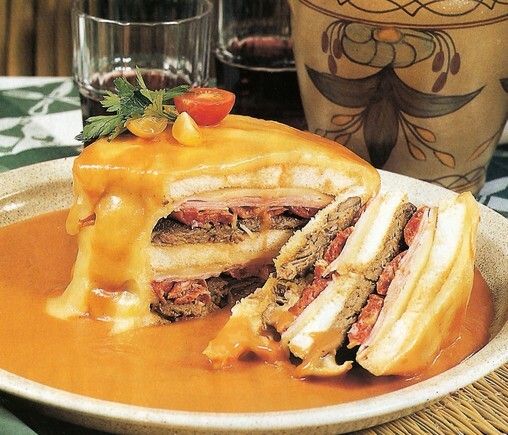 It is said that the now famous; Francesinha was invented in the city of Porto, Portugal, in the 1960’s by Daniel da Silva, a returned emigrant from France who tried to adapt the croque-monsieur to Portuguese tastes. There is no standard recipe for the sandwich which is typically made with ham, Portuguese sausage, and steak but there are many adaptations using different types of ham, sausages and various roasted meats other than steak. 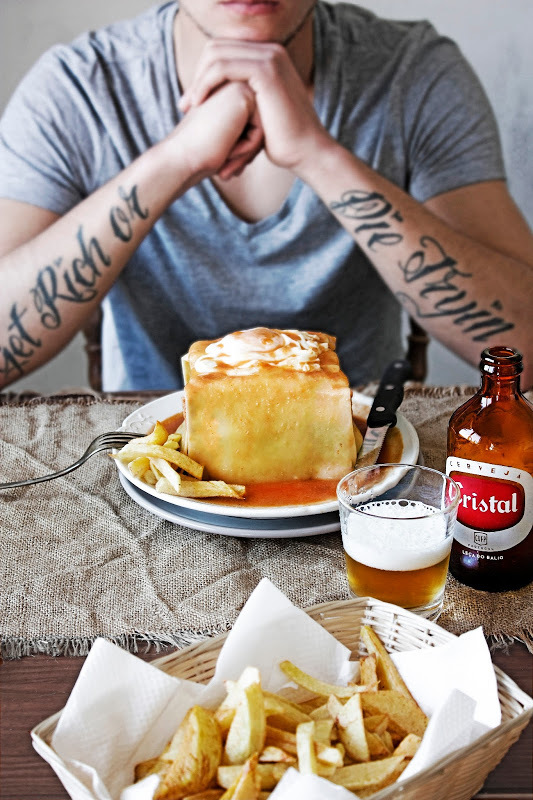 The rich beer and tomato based sauce that covers the sandwich is a secret but there are many variations. Some use a tomatoes, while others use various ingredients to create the sauce with different levels of spiciness added. The sandwich is famous throughout the city of Porto and featured at many restaurants. Visit the “For the Love of Port” website for their article “Best Fransicinha in Porto”; A comprehensive tasting and find the very best preparation of the sandwich throughout the city. Here are 2 interesting videos of how the recipe is made which I enjoyed watching. *Place all the ingredients for the sauce (except the corn starch and the piri piri) inside a heavy bottomed pan and take to the heat. Cook for aprox. 30 minutes in meddium heat. Season with salt and pepper and remove the carrot, bay leaf and steak. *Add the dissolved corn starch to the sauce a bit at a time, stir, let it come to a boil and if it´s still to runny add a bit more. Don´t make a very thick sauce, it should fall from the wooden spoon in a constant thread, ending up in thick drops. *Remove from the heat and add the piri piri to taste, which in my case means lots of it. *Grill the meats, I use a press grill because it´s easier to cook the sausage and linguiça. Cut the sausage and linguiça in half and then in 4 equal parts. *Cover the potatoes with cold water and keep in the fridge for 30 minutes or up to a day. *Fill a deep frying pan up to 2/3 with oil and heat it very well, drain the potatoes and clean them with a kitchen towel. Fry in small batches until golden. Drain on top of kitchen paper. *This way the fries will be crisp outside and soft on the inside. *On top of a slice of bread place first a slice of cheese, on top place a slice of ham, then the 4 pieces of linguiça, on top the steak, followed by the fresh sausage, another slice of ham and another slice of cheese, top with the other slice of bread and on top a slice of cheese. Place one slice of cheese in each side of the sandwich – You can hold the cheese with skewers and remove them once the cheese is melted, later – and place one more on top. *Put the sandwich inside a preheated oven for a couple of minutes just so the cheese starts to melt but let it toast. If you used skewers now is time to remove them. *Fry the egg in a bit of hot oil. *Remove from the oven, put the fried egg on top of the sandwich and immediately pour the very hot sauce over it – you want the bottom of the sandwich immerse in sauce – and serve with the fries and a cold, cold beer. *Keep a bowl with the sauce near so you can add more as you go.